Plugin to Tally with Tally Connector. 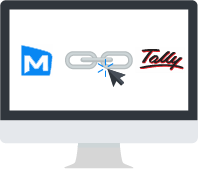 MaxxTallyConnector helps to export data from MaxxERP to Tally accounting software. MaxxTallyConnector Booster helps to Import the master and accounts data from MaxxERP to Tally software via XML files. Bill wise transaction and Inventory details can also be exported to Tally via Excel file format. Tally is one of the leading Accounting software used by many Accountants,CA and Auditors in Indian Business market for maintaining various Company accounts. MaxxTallyConnector Business Booster helps in exporting the master and accounts data in XML file format which can be imported to Tally in few simple steps making it easier for auditors. One click - Data export. Option to export data for a specific date range. Option to export Masters / Vouchers / Both. Simple steps to import data to Tally. Work become easier for Auditors/Accountants. Avoid manual double entries effort of managing two softwares. Double cross verification of accounts. Easy local statutory tax filing.